Back at the start of this year I received the email I’d been waiting for. Out of the blue, a woman from San Diego, California surfaced identifying herself as Emma Cunningham’s great-great-grandaughter. Sure I said to myself… Another notoriety seeker. But like a good historian, I followed it through. Cunningham is a mighty common name, and although I’ve been successful in locating many Burdell relatives, I’d never been able to pick up the trail of Emma and George D. Cunningham’s five children and their descendants. There had to be some somewhere. It took only two emails to confirm my luck. At first I thought that the correspondent was way off. She identified herself as Emma’s “gggrandaughter” and I took that for (a) a stutter, and (b) a wannabe with a poor sense of time. I must be getting really old: “gggrandaughter” stands for great-great grandaughter and the numbers work. 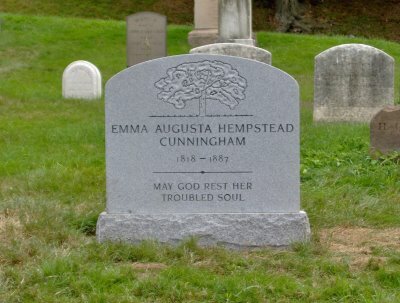 I’d lost the Cunningham trail after Emma’s remains were exhumed from their original resting place in the Morell family plot at Green-Wood Cemetery in Brooklyn where I work as a volunteer archvist. Emma was buried in her niece Phoebe Morrell’s family plot because Phoebe was a Hempstead by birth, a member of Emma’s father’s family. With the consent of various members of Emma’s first husband’s family (George D. was her first spouse) the unfortunate accused murderess was relocated to the Cunningham family plot in 1892. Here is her gravestone that we erected in 2007 after she had lain at Green-Wood in unmarked graves for 120 years. A letter from Emma’s son, William D. Cunningham, remains in the Green-Wood administration file, attesting to his consent to the interment. The return address is Loreto, Mexico, a town in Baja California. 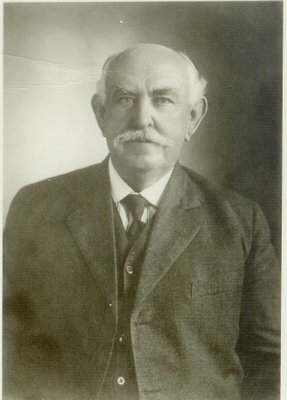 Many other Cunningham family photos and information came into my possession from my generous San Diego connection; the family still raises cattle on the same large spread in Baja that William ran in the 1890s when he wrote back to Green-Wood and provided Emma with a resting place next to the one man who at least tried to take good care of her before the Gold Rush did him in.